If you have a soft spot for plump and glossy udon, you will love this deeply warming Japanese classic served in a heavy earthenware pot. Add yuzu peel or some shichimi for a sharper finish. 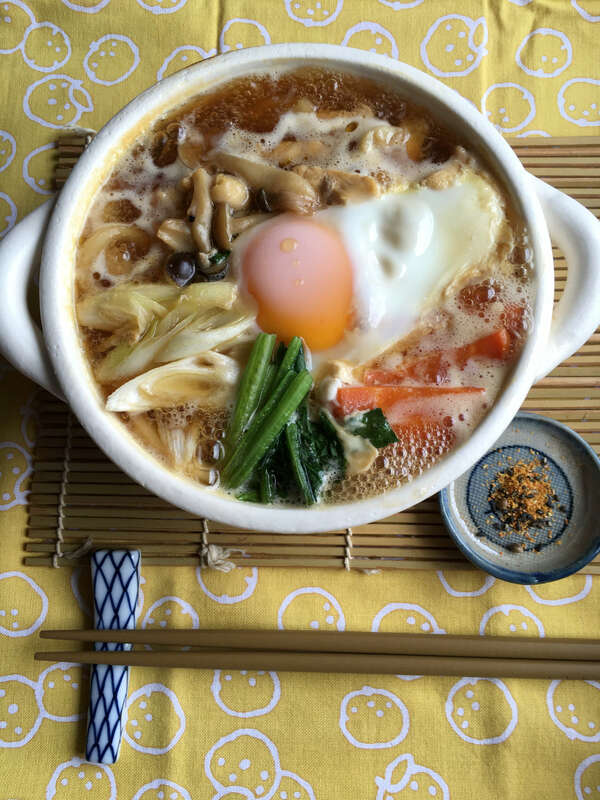 Thank you, Rie, our translator, for this homey recipe! Rie reads my mind like nobody does! Before I could ask her to translate my questions for the hosts, she would already have done so for me! Born in Saitama Prefecture, she grew up in Tokyo since she was seven, and is a city girl in and out. While she doesn’t cook much, she has a few comfort food recipes that she holds dear to, and this is one that restores her without fail. I will like to believe this dish is also why her complexion is flawless! To make the dashi soup, make a few slits in the konbu and soak in 1000ml water for 30 minutes before heating it up. Remove the konbu just before it boils. Add the dried bonito flakes, bring to a boil and strain. * If you use dashi seasoning powder, skip steps 1 and 2 and simply follow instructions on packaging. Add mirin, thin soy sauce and sugar, then bring to a boil again. Boil water in another pan to cook the udon. Drain with strainer. Put udon, chicken and vegetables into dashi soup and portion into two small earthenware pots (or 1 bigger pot for 2 pax). Bring to boil, add egg, cover and heat for 1 minute. Just before serving, add mitsuba, one piece of yuzu peel and season with shichimi if desired.